Died coloring noodles, it was so easy and cheap to make. I only got to making 40% of all the boxes I purchased, I didn't do much. I ran out of alcohol to soak it in and plan on headed back to the store for a larger bottle to polish off the rest. These make PERFECT counting shapes, Caleb counted out 15 several times today as his homework from home and then he played with them afterwards. I found the perfect storage jar for them in his bedroom and just need to fill it all up. 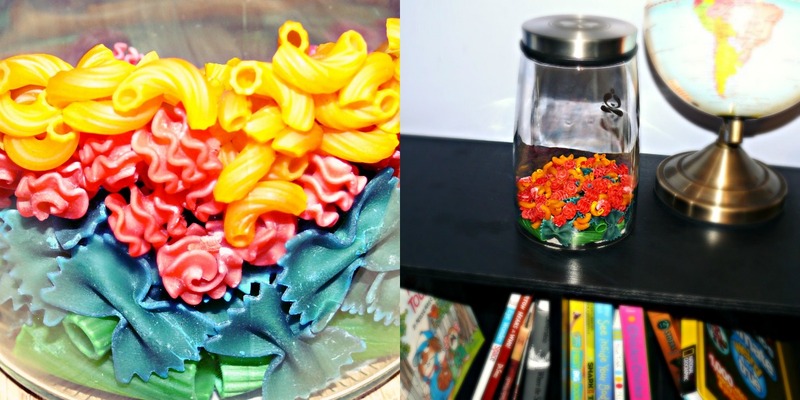 Here's how to make: fill Ziploc bags with noodles then cover to the top with rubbing alcohol, then add in food coloring. I used around 8+ drops for more vivid coloring. Then double bag the first bag to prevent any leaks or spills. Do this for the other colored bags and then let them soak for 24 hours. After that drain them, don't wash them. Let them air dry and then they are ready to use! SO many neat noodles at the store and different things you can make with them. Sounds easy enough and a great way to make some neat decorations. Coloring noodles is a really fun craft too! We've done the colored pasta for making fun necklaces. I never thought to use them as counters for math. That's an awesome idea! Especially since my first grader is just now getting into addition and subtraction with bigger numbers. Awesome!! !